CEO of Riamwind Co. Ltd.
We have been investigating the efficient utilization　of　wind　energy　at the Research Institute for Applied Mechanics (RIAM),　Kyushu　University. We have developed a new wind turbine system that consists of a diffuser shroud with a broad-ring brim at the exit periphery and a wind turbine inside it. The shrouded wind turbine with a brimmed diffuser has demonstrated power augmentation by a factor of about 2–5 compared with a bare wind turbine, for a given turbine diameter and wind speed. We have developed the small wind turbines of 1-3kW and a mid-size of 100kW wind-lens turbine for practical application. Aiming at harnessing offshore wind energy, we developed a floating platform equipped with the shrouded turbines of 3kW x 2 units and PV panels of 2kW in Hakata Bay, Fukuoka. In recent years, our concept of the research on renewable Energy is based on a key word of “Small is profitable”. In general, wind turbines which are not needed so large, and floating bodies on the sea are also requested as a medium one. Considering about the social acceptability and environmental problems, using a small and medium size wind-lens turbines, we have been developing a multi-rotor system, namely a clustered wind-lens turbine for obtaining large power output. 2. What is the wind-lens turbine? Wind power is proportional to the wind speed cubed. If we can increase the wind speed with some mechanism by utilizing the fluid dynamic nature around a structure, namely if we can capture and concentrate the wind energy locally, the output power of a wind turbine can be increased substantially [Ohya 2010]. There appears hope for utilizing the wind power in a more efficient way. In this study, this concept of accelerating the wind was named the "wind-lens" technology. The present study aims at determining how to collect wind energy efficiently by using a simple structure (called wind-lens). For this purpose, we have developed a diffuser-type structure that is capable of collecting and accelerating the approaching wind. Namely, we have devised a diffuser shroud with a large brim that is able to increase the wind speed from approaching wind substantially by utilizing various flow characteristics, e.g., the generation of low pressure region by vortex formation, flow entrainment by vortices and so on, of the inner or peripheral flows of a diffuser shroud equipped with a brim, as shown in Fig.1. Although it adopts a diffuser-shaped structure surrounding a wind turbine like the others, the feature that distinguishes it from the others is a large brim attached at the exit of diffuser shroud. Furthermore, we placed a wind turbine inside the diffuser shroud equipped with a brim and evaluated the power output generated. As a result, the shrouded wind turbine equipped with a brimmed diffuser demonstrated power augmentation for a given turbine diameter and wind speed by a factor of about 2–5 compared to a standard wind turbine. The important features of this wind turbine equipped with a brimmed diffuser shroud are as follows. Two-fivefold increase in output power compared to conventional wind turbines due to concentration of the wind energy (“wind-lens” technology). Brim-based yaw control: The brim at the exit of the diffuser makes wind turbines equipped with a brimmed diffuser rotate following the change in the wind direction, like a weathercock. As a result, the wind turbine automatically turns to face the wind. Significant reduction in wind turbine noise (Fig.3): Basically, an airfoil section of the turbine blade, which gives the best performance in a low-tip speed ratio range, is chosen. Since the vortices generated from the blade tips are considerably suppressed through the interference with the boundary layer within the diffuser shroud, the aerodynamic noise is reduced substantially [Abe 2006 & Takahashi 2012]. Improved safety: The wind turbine, rotating at a high speed, is shrouded by a structure and is also safe against damage from broken blades. As for demerits, wind load to a wind turbine and structural weight are increased. This wind-lens technology is also applicable to water turbine. We have recently showed the same improvement in efficiency using a prototype of water-lens turbine using a water tunnel (2015). The wind turbine industry has seen innovations leading to growing size of turbines of currently over 140 meters in diameter. However, as pointed out by some recent studies, scaling of blades has its limitations and therefore advantages of multi-rotor system concepts have been suggested by Jamison et al [Jamieson 2012]. We have been investigating the aerodynamics of wind lens turbines spaced closely together comprising a multi-rotor system. We spaced three of these turbines closely in an array perpendicular to the flow and measured power output. Several different wind lens configurations have been used, mainly varying the brim height and the diffuser shape. Following the trend of up scaling turbines and reducing the cost of energy at the same time, recent studies show that multi rotor systems have several advantages. Multi rotor turbines are turbine systems comprising several rotors in one structure. In our research we investigate on the aerodynamics of multi rotor systems using wind lens turbines. Wind lens turbines are spaced closely apart to observe their effect on each other’s performance. The focus is on three turbines in a triangle arrangement. Different wind lens configurations are used, mainly varying the brim height between 3% and 10%. In wind tunnel experiments we could show that closely spaced turbines have an influence on each other’s power output. Increasing the separation gap, the total system power output exceeded the sum of the stand-alone turbines. Namely, in the closest spacing the cumulative power of all three turbines drops compared to the cumulative power of three stand-alone turbines. When increasing the gap between the turbines the power output restores to the same value, in some cases the power even exceeds the value of the three stand-alone turbines. Further it was observed that the individual power of a turbine output doesn’t follow the trend of the cumulative power output. These phenomena can be explained with flow patterns observed in gap flow analysis of bluff bodies. Figs. 4 and 5 show the future MRS using lens turbines for 300kW MRS to MW MRS.
Our first offshore hybrid energy farm experiment in Hakata bay, Fukuoka, Japan was initiated. One of the main goals of this experiment was to clarify the advantage of wind farming at offshore locations, even relatively short distances from the adjacent shore, with typical annual average wind speed in Japan. The floating platform is equipped with new type of highly efficient shrouded turbines, named the “Wind-lens turbine”. In early December 2011, an 18 m wide floating pre-stressed concrete platform was launched and moored 800 m off the coast of Fukuoka, as shown in Fig.6. 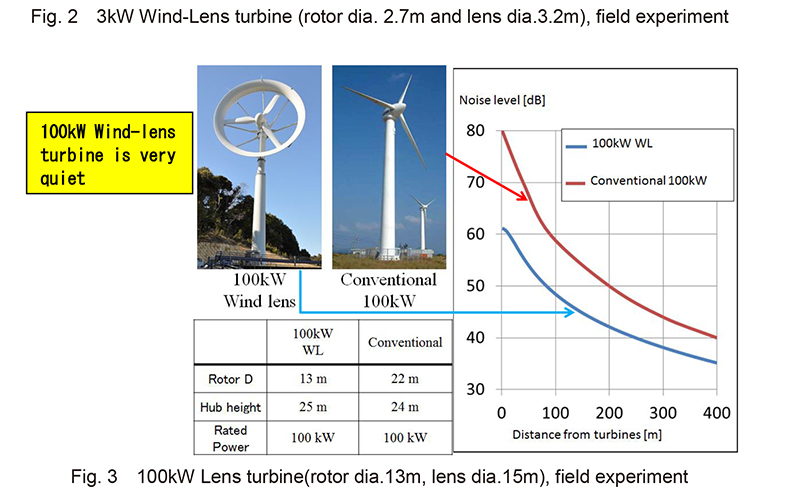 The wind speed and corresponding power production were compared with a similar land based Wind-lens turbine system nearby on the shore, 3.7 km from the platform. Data from a year of operation showed higher annual average wind speed and doubled power production, indicating a clear advantage for offshore wind farming. We are planning a new type of floating energy farm for practical application. As shown in Figs. 7 and 9, a floating body with 70 m wide consists of a triangle semi-submarine structure and will be connected to multi-triangle body. On this floating body, a MW multi-rotor system consisting of lens turbines of 300kW and solar panels are installed. 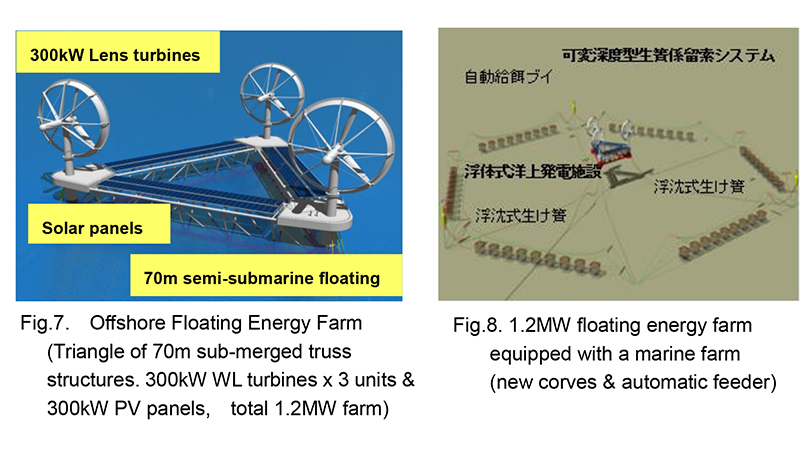 Finally, Fig.8 shows a plan of a floating energy farm by surrounding a marine farm which is equipped with new feeding system and many corves. We are aiming at the realization of a fishery–harmonious floating renewable energy platform. We thank to Ministry of Environment, NEDO and Fukuoka city for our projects. Ohya, Y.; Karasudani, T. A shrouded wind turbine generating high output power with Wind-lens technology. Energies 2010, 3, 634-649. Abe, K. et al. An experimental study of tip-vortex structures behind a small wind turbine with a flanged diffuser. Wind Struct. 2006, p413-417. Takahashi, S., Ohya, Y., et al. Behavior of the blade tip vortices of a wind turbine equipped with a brimmed-diffuser shroud. Energies 2012, 5, 5229-5242; doi:10.3390. Jamieson et al. Multi-Rotors: A solution to 20 MW and Beyond?, DeepWind, 19-20 January 2012, Trondheim, Norway. Kyozuka, Y. Demonstration experiment of offshore wind power generation by a hexagonal floating platform in Hakata Bay. Proceedings of 2nd Asian Wave and Tidal Energy Conference (AWTEC-2014), Tokyo, Japan, 28 July 2014. Watanabe, K. Ohya, Y., et al. Numerical prediction and field verification test of wind-power generation potential in nearshore area using a moored floating platform, Journal of Flow Control, Measurement & Visualization 139 (5), 21, 2017. Copyright © 2012-2016 株式会社リアムウィンド. All rights reserved.